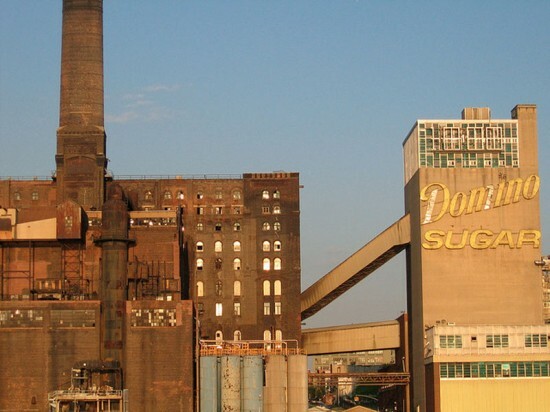 The redevelopment of Brooklyn’s Domino Sugar Factory has been a long and controversial process, but is showing signs of progress, or at least a slow but steady crawl to the next phase of planning. The Wall Street Journal reported reported that developer Jed Walentas of Two Trees Management wants to make room for office space in addition to residential units long proposed for the site. The Brooklyn-based firm purchased the 11-acre property last October for $185 million from Community Preservation Corporation Resources (CPCR). Two Trees, known for its transformation of DUMBO, hopes to apply its successful mixed-use formula to north Brooklyn, which has been dominated by clusters of residential high rises over the last decade. Several waterfront neighborhoods in Brooklyn, stretching from DUMBO to Greenpoint, have become home to a number of tech companies, including Kickstarter, Etsy, and Indmusic. Walentas would first need to win the approval from City Council and the Department of City Planning to rezone the area to accommodate office and commercial development. But such a change might not be that easy to make. In 2010, when CPCR sought, and later succeeded, in rezoning the area, the community put up a fight. The promise of affordable housing won over government officials, but Two Trees is mum on whether they plan to follow through on that commitment. Within the last few months, Two Trees has hired SHoP Architects to create the master plans for the Domino Sugar Refinery, taking the place of Rafael Viñoly, and has also enlisted the help of landscape architecture firm, James Corner Field Operations. In December, Two Trees issued a RFP for a proposal suggesting a “creative use” of Site E on Kent Avenue between South 3rd and South 4th streets, according to Brownstoner. Several proposals offered recommendations such as a High Line-style parkland, a skating rink, or open markets.